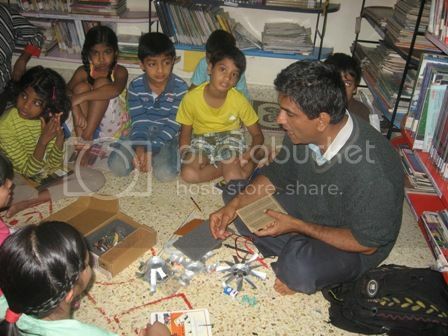 An invited expert in any knowledge area spends time with the children and shares about his or her expertise. Children interested in attending these talks or activity-oriented sessions interact and gain exposure to how things are done in real world situations. Live station is all about people from different walks of life stopping by to spend some value time with children at Aarohi”. The station have “domain experts” coming and showing / sharing / working with aarohi children. a doctor interacting and telling all about the profession etc. A musician coming and sharing what one musician can do, playing for children a piece and just spending some time with kids. Somebody with the skill of embroidery coming and working for few hours and demonstrating the skills. If any child wants to learn by their choice, they do with the expert. This is a voluntary event (which means visiting expert does not get remunerated). We are looking for enthusiastic people who want to showcase their skills and interact with children. If further the child is interested to learn more, child will connect with you and you charge for your time and efforts. Interacting with people and learning from them is part of our life learning curriculum. So interacting with you becomes vital and valuable for their learning. Children will benefit from exposure skills and different personalities. Visiting experts will benefit from interacting with children and getting to know their perspective. Anyone, parents, friends of parents, friends of friends, anyone who is so passionate about their work or anyone who likes sharing with children. So the discipline can be anything, a gardener showing gardening skills, a lady showing how to bake choco chip cookies, a person how he can juggle with balls, an electrician showing how to fix a fan, a computer geek showing how to make cute animations in flash, a doctor interacting and telling all about the profession etc. Is there any specific day, time to come ? No, you can come any time (between 8:30 to 4pm), any day(Monday to Thursday). We will coordinate with you. You can come for few hours to our Indira nagar campus OR and you can come and stay with us at our O-campus(in Hosur). What all I need to bring? Whatever you want to share. If there are any consumable by the kids - you can tell us we can procure or if you procure, we will be happy to reimburse. You can share what you do, how to do, what made you to do this? What all one needs to have to do this kind of work? What all challenges/ WOW? What will children learn in one interaction/ demonstration? The objective is not to teach anything but to expose the child to various skills/ professions. If the child wants to learn, the child will take initiative and further connect with you. We believe children are natural learner - all they need is an environment and at live station you are part of that learning environment who is sharing your skills/ experience. Permalink Submitted by girija (not verified) on 29 November, 2012 - 11:42. Submitted by simone on Thu, 29 Nov 2012. Nora Aunty met with the children today to talk about life in America and being an immigrant in India. We talked about differences in family life, public life, food, travel, festivals and religion. Many of the children had traveled to the U.S. before and some had lived there previously, so they know a good deal about American culture. They were surprised by a few things we talked about:: no idli, dosa, sambar, pongal in the US; no autos; no noise on the road; older people often live in homes together and not with their families. One child stumped me when she asked why we have brown hair and blue eyes! I was not prepared to talk about chromosomes and genes but another student helped out explaining that children inherit physical traits from their parents, and, I added, light eyed, light skinned Americans are descendants of Europeans who come from cold climates and spent winters inside as opposed to people who live closer to the equator and spend the full year exposed to sun. Phew! The children were very curious and asked many questions. Their curiosity has motivated me to ask my friends from around the world living in Bangalore to present their cultural heritage and experience of living in India. I will warn would-be-presenters to be ready for any question! Permalink Submitted by girija (not verified) on 10 February, 2013 - 17:56. The kids were very interactive and enthusiastic throughout the session. They showed lot of interest in the story i told and were very attentive . I had fun creating stories with them. I hope they enjoyed the session as much as i did . I wish them all the best .